ATM is Proud to Sponsor the Resilience Day of the Leadership Institute 2018-19 program by ULI SE Florida / Caribbean District | Applied Technology & Management, Inc. The ULI Leadership Institute program provides a unique opportunity for mid-level professionals to attend monthly daylong classes over a nine-month period that involve a mix of lectures, mobile tours, and other experiences. The Resilience Day is a one-day program focused on discussing emerging resilience approaches to real estate and urban planning, including climate change impacts and sea level rise adaptation. ATM’s Esteban Biondi co-chaired the Resilience Day since this ULI District started the Leadership Institute program in 2017. The mission of the Leadership Institute is to cultivate leadership and life-strategy skills and preparing emerging leaders in the real estate and land use industries to advance the implementation of best practices in the Southeast Florida/Caribbean region. ULI is the oldest and largest network of cross-disciplinary real estate and land use experts in the world. ULI is its members—delivering the mission, shaping the future of the industry, and creating thriving communities around the globe. 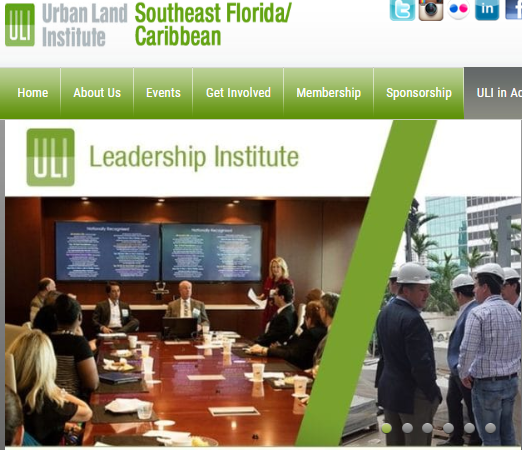 The ULI Southeast Florida/Caribbean District Council is one of the largest and most diverse in the ULI, serving the 6th largest metropolitan area in the US and all the Caribbean islands. Applications for Class of 2020 are now open. Participants are selected through a competitive process.